The crash on College Avenue was one of several that occurred Friday morning in the Waterville area, a day after a nor'easter brought about 10 inches of snow to most areas of central Maine. WATERVILLE — A woman and two children were taken to the hospital Friday morning after a two-vehicle crash on College Avenue that police think may have been related to slippery roads. The accident was one of several that occurred Friday morning in the Waterville area, a day after a nor’easter barrelled through the region and brought about 10 inches of snow to most areas of central Maine. Plows were still out on the roads Friday, as slippery conditions persisted and the temperature stayed in the single digits and low teens. The crash occurred at 9:55 a.m. when a 2013 Toyota Highlander sport utility vehicle driven by Tonya Joler, 45, of Benton, was leaving Getchell Street and Joler was intending to turn south on College Avenue when the vehicle collided with a 2012 Chrysler Town & County van being driven south on College Avenue by a 16-year-old boy who was driving on a permit, according to Waterville police Sgt. Alden Weigelt. A licensed driver, Melissa Finley, 35, of Weeks Mills, was in the front passenger seat of the Chrysler van and a 10-year-old child was in the back seat of the van at the time, Weigelt said. Finley and the children were taken by Delta Ambulance to MaineGeneral Medical Center in Augusta, he said. Finley and the 10-year-old were complaining of pain, he said. Joler was reported to be uninjured. No charges were filed in the crash, which was investigated by Waterville police Officer Linda Smedberg. 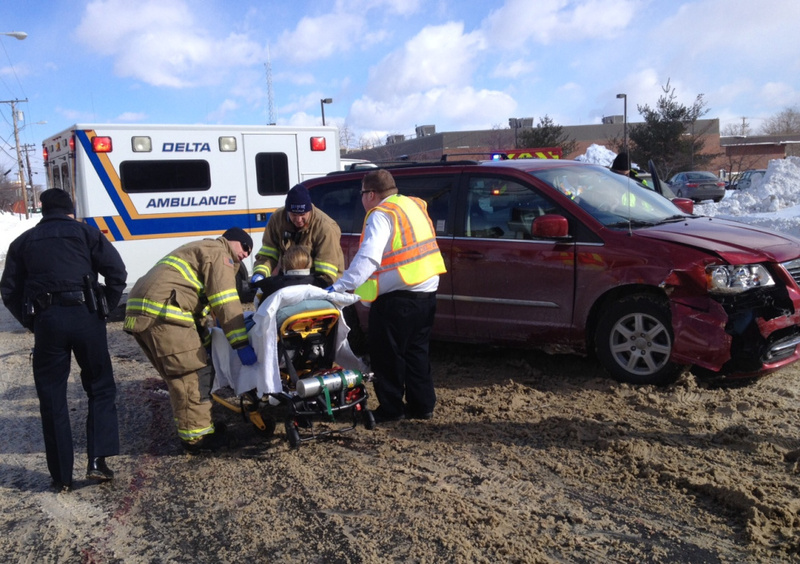 At the scene, Waterville police and fire officials, as well as Delta workers, tended to the victims. The Toyota’s left front fender was smashed in, as was the van’s right front fender. The vehicles were towed away from the scene. Meanwhile, another crash occurred at 10:26 a.m. when a vehicle slid into a parked vehicle near The Concourse and Main Street, according to Weigelt. “There were no injuries, but it was definitely road condition-related,” he said. At 9:09 a.m., a vehicle struck a sign on Washington Street. At 8:59 a.m., an accident occurred on Webb Road near the Oakland town line; Oakland police covered that crash, Weigelt said. Other accidents reported in Oakland occurred at 8:09 a.m. on Sawtelle Road and 8:41 a.m. on Belgrade Road, according to Weigelt. He recommended that drivers slow down when road conditions are bad and make sure they have warm clothing and adequate fuel in their vehicles. “It would really be helpful to emergency services if people travel only when it’s absolutely necessary when the conditions are very poor, which they are expected to be,” he said.